Sake(Pronounced "Sakei") is an alcoholic beverage made by fermenting rice. There are two types of rice wine. One is for drinking and other for cooking. 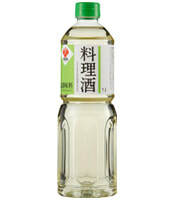 A cooking sake is one of the most important ingredients in cooking Japanese dishes along with soy sauce in mirin. Brings out the umami in the material and gives flavor and depth. You can use drinking sake for cooking, but as the cooking sake is developed for the purpose of cooking with more organic acid for flavor and umami. Besides that, cooking sake will be significantly less expensive, so save your drinking sake for your pleasure! If you use this type of sake, make sure you add less salt as the salt content is quite high (2-3%) Although the price is cheaper, it sacrifices some function of the sake such as adding more flavor and umai to the ingredient as well as sealing the flavors in. Also, as it is not considered as liquor thus not bound to it's regulation, it is free to add other things than rice, so it may contain other additives. If you would like to avoid this, choose the one that says 純米料理酒（junmai ryourishu) which means "100％ rice cooking sake" and would only consist of rice and salt.